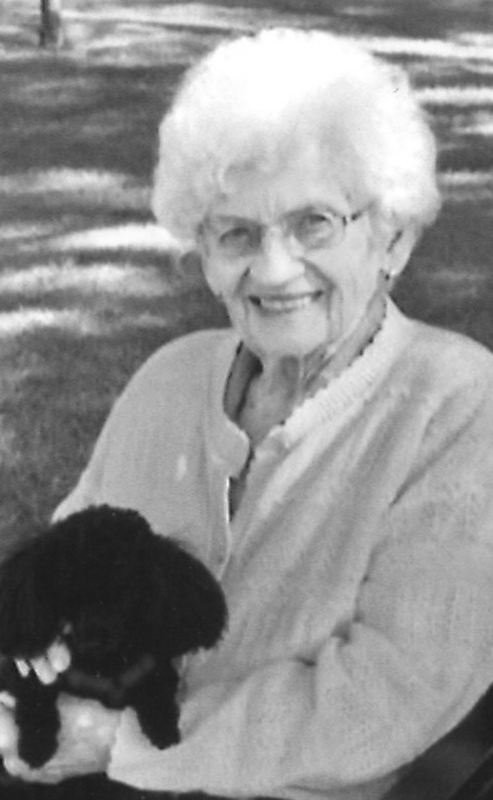 Mary Credico (nee Lastuka) of Lethbridge, beloved wife of the late Jack Credico, passed away peacefully at Edith Cavell Nursing Home surrounded by family at the age of 94 years. Mary was born in Hardieville and spent most of her childhood in Coaldale, graduating from R I Baker High school. After a short time in Wrentham, she moved to Lethbridge with her sister Vicky and worked at the Galt Hospital. Mom met Dad before he left for the war when her best friend introduced Mom to her boyfriend who then decided our mom was a better choice. They continued to write during the war and when dad was on leave, they were married on July 25, 1945. After the war, they began their married life working in Grandpa’s bakery, Canadian Union Bakery at 4 Ave and 13 St North, and started building their home where they lived their entire lives. Baking and cooking were some of mom’s specialties, along with her vegetable and flower gardens. She was involved in St Basil’s Home and School and was a proud member of St Basil’s CWL for over 60 years, holding positions of Treasurer and group leader. After Dad’s passing over 30 years ago, mom enjoyed her time and travels with the Lethbridge Seniors Citizens Organization (LSCO) and functions at the Romulus and Remus Italian Canadian Club. Mom was a friend to all animals especially her pets and the pets of her children. She particularly liked penguins; learning about them, collecting and naming them. And on her 90th birthday she spent an enjoyable afternoon with her daughters and granddaughter visiting the penguins at the Calgary Zoo. Mary is survived by her daughter Carliss Glover of Edmonton; son Rick (Grace) of Lethbridge; daughter Connie (John Dragani) of Vancouver; son Randall (Tam Pham) of Vancouver; sister Victoria of Lethbridge; brother George (Lois) Lastuka of Lethbridge; grandchildren Brenna, Peter, David and Michael and numerous nieces and nephews. Besides her loving husband Jack, Mary was predeceased by her parents; sisters and brothers- in- law Rose (Ken) Barnett; Ann (Bax) Jones and John M Credico. Rest in peace Mom, you’ve earned it. Dad is waiting for you. A Vigil Rites (Prayer Service) will be held at 7:00pm on Tuesday, April 16. 2019 at MARTIN BROTHERS RIVERVIEW CHAPEL, 610 – 4 Street South, Lethbridge, Alberta. A Funeral Mass will be held at 1:30pm on Wednesday April 17, 2019 at ST. BASILS ROMAN CATHOLIC CHURCH, 604 – 13 Street North, Lethbridge, Alberta, with Father Kevin Tumback, celebrant. Interment will follow in the Mountain View Cemetery. Flowers are gratefully declined. For those who wish, memorial donations may be made to the ALS Society of Alberta, 7874 – 10 Street NE Calgary, Alberta, T2E 8W1, or a charity of your choice.